Enhance your fireplace and give it a more contemporary look with the Real Fyre Geo Shapes and Stones. These River Rocks are smooth as if pulled from a river bed! Includes 10 assorted rocks. Please choose color. Geo Shapes and Stones are for use with your vented fire glass or gas log set. How many stones come in each order of the river rock? Each order of the stones included 10 cast ceramic rocks of varied size. Are you able to use real stones in a fire? Real stones should not be used in a fire. The stones can expand at uneven rates, causing them to fracture and crack. This can send shards of rock flying, resulting in injury. 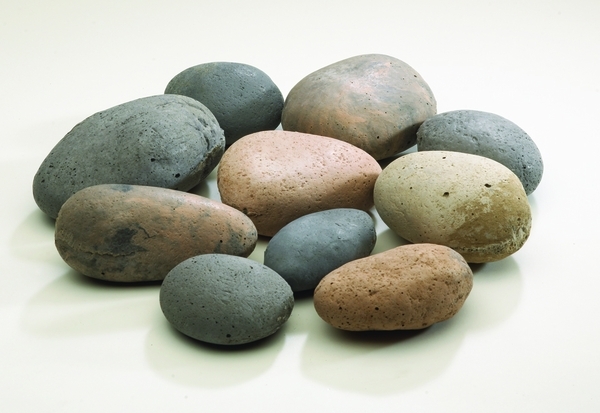 Only heat resistant ceramic stones should be used. Are these rocks or pebbles? These are small rocks of varying sizes.